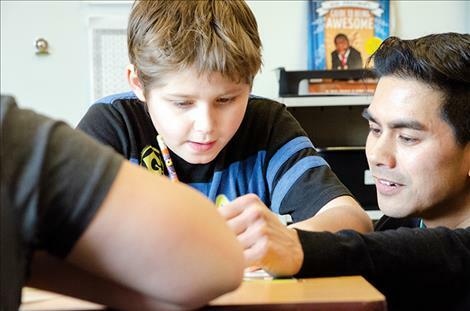 Alex Alviar guides a child through the poetic process. Students answer questions to create a class poem. 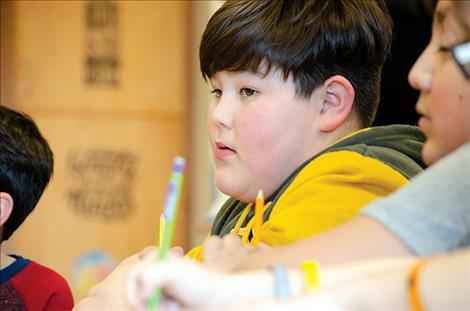 PABLO – The fourth-grade students looked pretty quiet sitting at their desks, writing with yellow pencils, but their work offered a look into a room wild with imagination. 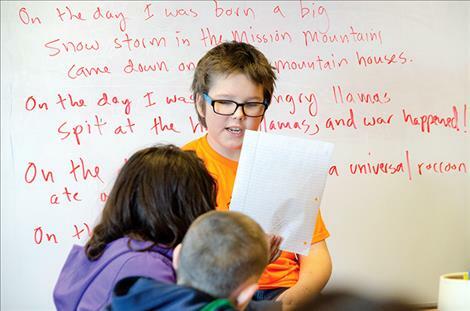 The magic started when two classes at Pablo Elementary School came together for their weekly poetry-writing workshop hosted by the Missoula Writing Collaborative. The Collaborative pairs groups of students with a professional writer giving them the opportunity to learn about the power and potential of language. These students on this Thursday afternoon were working with poet Alex Alviar. With excitement, Alviar said to the students: “I want you to travel back with your imaginations.” He explained that they wouldn’t be visiting any ordinary day. They were going back to the day they were born. The students really got on board when he said the scene didn’t have to be real. The students caught on quickly. One child waved his hand in the air and said: “On the day I was born, the sky opened up and it rained potatoes.” Another student imagined “a pod of dolphins swimming in the ocean” on that day. And another student said it was more likely that llamas were having a party on the day he was born. Alviar has been working with this group for several weeks. The llama comment made him smile. 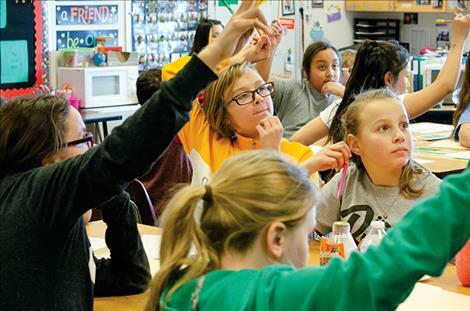 “I’ve never seen a class write so much about llamas,” he said. The first time he guided a poetry-writing workshop with kids for the Writing Collaborative was back in 2003. 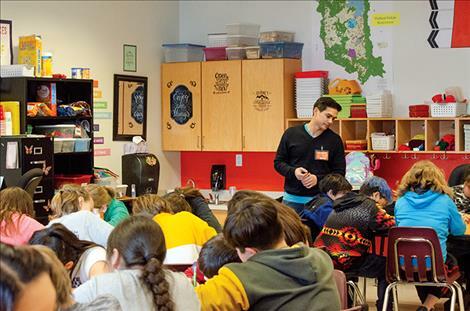 Alviar has led poetry workshops in Ronan, Arlee, St. Ignatius and Pablo. He has a master’s degree in fine arts from the University of Montana and has published a few poems. “Publishing is not as interesting as teaching,” he said. The students continued to work with Alviar to create a class poem to help them get a feel for the day’s project. The students raised their hands and added lines to the poem. Alviar wrote them on the board. After a bit of practice, they went into “poetry writing mode” and tried writing their own piece. “First, tap into the back of your brains and go deep-deep down,” he said. 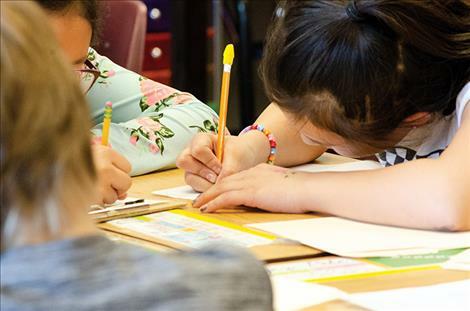 The students bent their heads down with eyes to the paper and started writing. While they worked, Alviar moved around the room offering help. 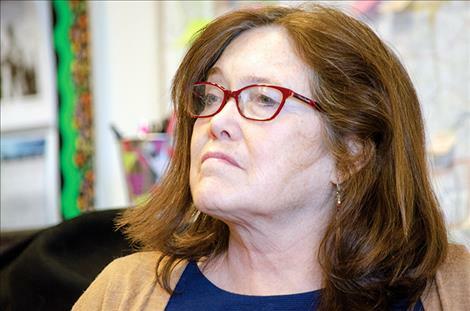 During this workshop, Caroline Patterson, writing Collaborative executive director and writer, was at the school as was Sheryl Noethe, the program’s artistic director and writer. They also traveled around the room to work with the students. Nine-year-old Liam Shepherd said his poem was about the day he was born in Las Vegas. He said he really likes working on his poems with the workshop. “I like putting my images on paper,” he said. A few students took turns reading their work from the “poet’s chair” at the front of the class. Alviar read a few more student poems to the class before the workshop ended. The day’s work went into individual folders when they were finished. At the end of the 12-week workshop, the students will have another poetry reading and their best work will be published together in a class anthology. 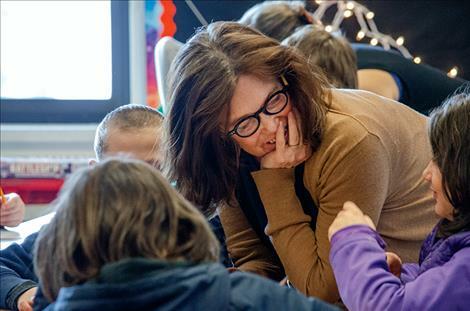 Projects like this began in Missoula in 1994 when Noethe moved to the area from New York and decided to combine her passions for writing and teaching. She put together a board and found grant money to fund the project and bring it into schools. Patterson started out working with students in poetry workshops and is now the executive director with a focus on bringing in grant funding to support the program. She said the National Endowment for the Arts supplies funding for workshops on the Flathead Indian Reservation currently located in Arlee, St. Ignatius, Dixon, Ronan and Pablo with different writers working in those schools, including Caroline Keys and Anna Zumbahlen.